Costume Contest and Kickstarter News! Submissions for the 2nd Annual Q2Q Comics Costume Contest are now closed. Thanks to everyone who submitted! The winners, one first place and two runners up, will be announced later today, after the winners have been notified. So check back later for that. 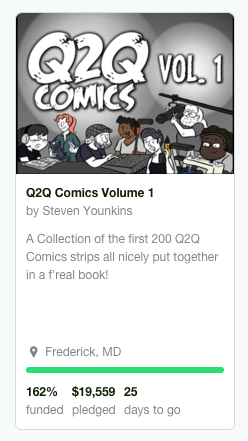 The Q2Q Comics Volume 1 Kickstarter is still going strong! We’re over 160% funded approaching our second stretch goal, which would add 20 more comics to the book. After that, we’re eyeing up making the edition hardcover, which would be super cool. Thanks to everyone for backing and sharing it. You’re all amazing! This entry was posted in Q2Q, Shop. Bookmark the permalink. ← Last Chance for Costume Contest Entries!